Council of The European Union To Kill Net Neutrality : We Must Act! Paris, 14 April 2015 — On 3 April, the European Parliamant voted a text in favour of Net Neutrality, protecting a free and open Internet, but Member States gathered at the Council of Ministers have come back on the progress made. The legislation process continues in the form of negotiations to lead in an agreement between the European Parliament, European Commission and the Council of the European Union. 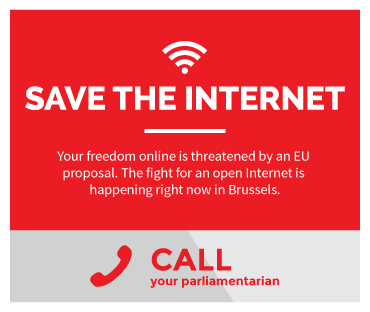 In order to protect and guarantee all the advances from last year’s vote, a coalition of civil society organisations have launched the campaing website savetheinternet.eu and urge citizens to call their eurodeputy to defend their rights and freedoms. On 22 January 2015, La Quadrature du Net warned about the potential risks in the document negotiated between the Council and the European Commission. It turns out that our concerns were well founded, since the text produced on 2 Mars by the Council of Ministers does not include Net Neutrality at all. The questioning of this basic principle leads to the end of equal treatment of data on the Internet. Even the US has realized how disastrous the consequences of such an act would be, and on 26 February voted for the acknowledgement of the American Internet as a “common good”, the first step towards a protected and non-discriminatory access to the Internet. The strong sign sent by the European Parliament in favour of the rights and interests of the European citizens for Net Neutrality is thus sweapt away by the governments of the Member States. The European Parliament proposed especially a balance between the principle of non-discrimination and the protection of users’ freedom to choose between innovation and free movement, in particular through the possibility given to operators to develop innovative access offers (“specialized services”). On the contrary, the text voted by the Council contains a tacit agreement of trade pacts that allow prioritisation within all actors in the Internet. As a result, internet providers would be able to negotiate with content providers or Internet users to “ensure a minimum quality service” (which entails prioritizing some information flows over others), thus favouring the short-term interests of telecommunication operators and of Internet giants, while harming the communication flows of all others. Such measures are a grave breach of the non-discrimination principle and severely violate freedom of communication. Over the next weeks, negociations on this text will continue in a trilogue (gathering representatives of the European Parliament, European Commission and Member States), before a formal endorsement. For these reasons, in collaboration with other European Associations, Initiative für Netzfreiheit (AT), European Digital Rights (EU), Access Now (international), Digitale Gesellschaft (DE), Bits of Freedom (NL), Reporters Without Borders (international), Open Rights Group (UK), IT-Politisk Forening (DK) et X-net (ES), La Quadrature du Net participate to the relaunch of the campaign Save The Internet and calls on citizens to act right now. It is fundamenal and urgent to act. To preserve our right to use an Internet based on principles of non-discrimination and liberty, we must contact our representatives in the European Parliament and urge them to safeguard Net Neutrality agains the recommendation of governments and Telecomunication Industry lobbies.